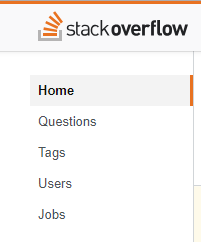 Why is the search field so small? Also I find it annoying that the menu isn't always in the screen anymore (while there is plenty of space). Collapsing the menu doesn't really give you more space. I would expect the main part of the screen would use the space of the menu when it is collapsed. My first impression of the left nav was pretty negative. 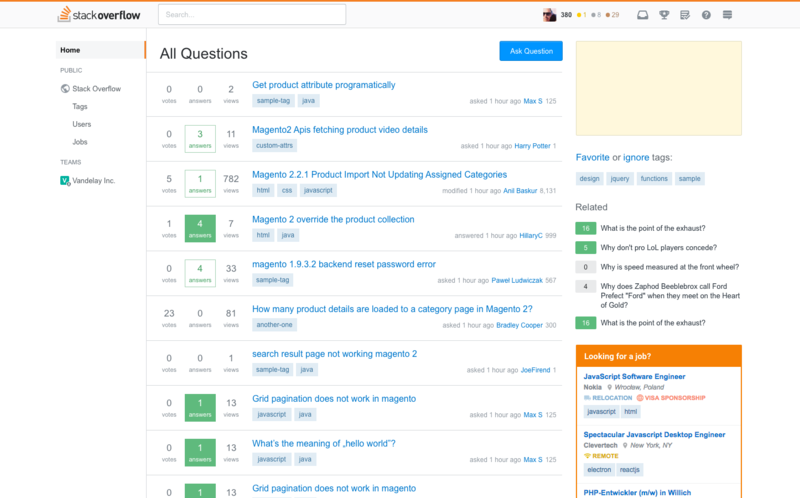 All I saw there were links I didn't care about, and any time I went to a question list, the first thing I saw on every load was the navbar, and as I was reading through the questions, my focus kept switching to the new navbar on the left. I'm sure a lot of that was because it was new, but it kept happening, and it was frustrating. Disabling it made me feel better about it. Now, however, after discussing it for a bit, testing it, messing around with it, I do think the only real problem I had with it was I felt like it was distracting me, pulling my attention away from what I was looking for. I found that one small change made all the difference for me, and that was giving the body of the page a background color. It didn't matter what color it was, as long as it put the primary content of the page into a separate box from the navbar on the left, it no longer distracted me. Here I just pulled the background from the header and added missing borders. I can of course make this change myself later via a userscript if it doesn't go live, but that's my suggestion. That menu has a lot of whitespace; I mean a lot. And yet even with my rather large browser window it pushes the content to the right slightly. I'm guessing it's so darn big to accommodate large team names; but this still feel really excessive. I expected it to hug the actual side of the screen. Additionally, the highlight bar butting up against a single pixel gray vertical line is jarring and distracting depending on the content in the center panel. 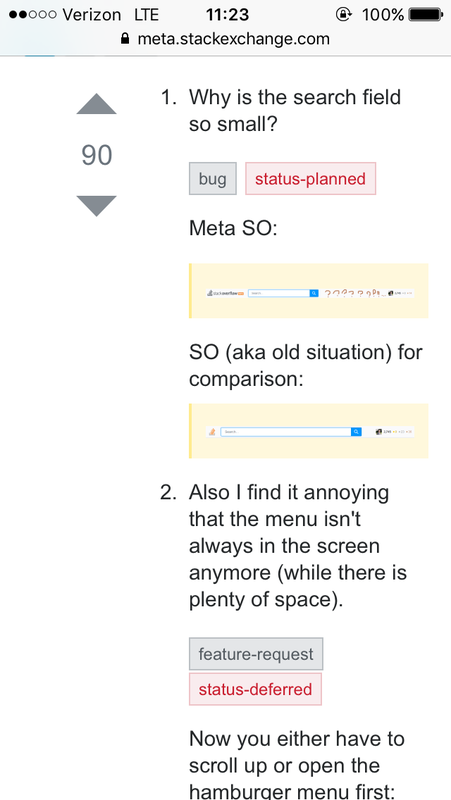 When on the left, it still highlights the tab, doesn't look like a scrollbar (as per the comments), and doesn't clash with the vertical line content separator. The only difference is it pushes the text in the tab in by the width of the border, so the words don't exactly line up. Sacrificing more of my screen real estate for showing things I do not need is not an improvement. Even with the left bar switched off (thanks for this option, as such) I now see 40% of my right margin occupied by things which were previously hidden away in the margin. Promoting navigation aids and advertising over actual content is not "responsive" at all in my book. The left bar adds insult to injury by doing the same on the left-hand side. I can understand how menus make some things slightly less discoverable (and frankly, the menu design on this site is really not transparent, consistent, or logical) but putting trainer wheels on everyone's bikes just because there are some beginners who cannot yet ride without them is a terrible design. 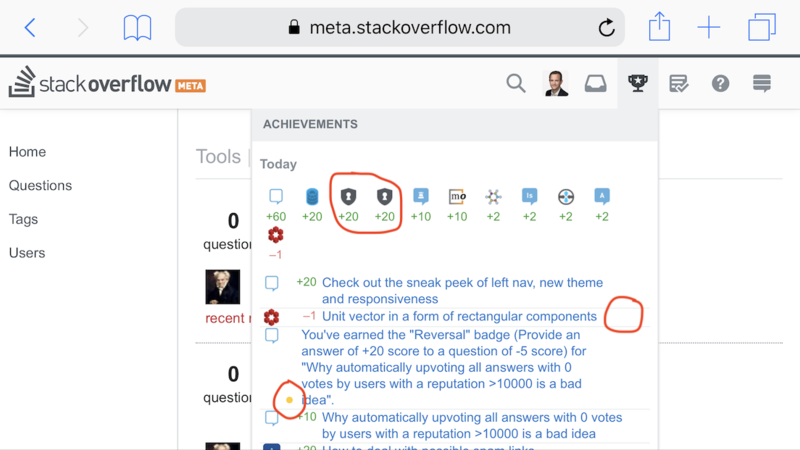 I like Kevin B's proposal to move the left bar into the top bar; having the main content assaulted from both margins is a losing proposition, whereas having stuff tucked away at the top (and ideally scrollable out of sight ... though that too is now a tick box you have to discover in your preferences!) so you can get your designated window filled with the actual content you want to look at would work pretty well. If you have to make the top bar higher or more complex to accommodate proper menus, so be it. 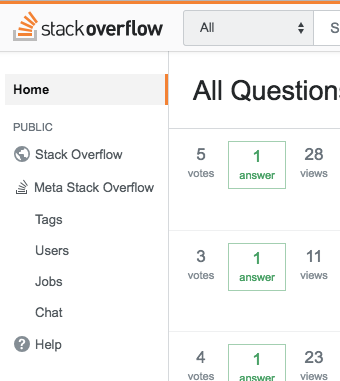 Would it be possible to move the voting buttons to be next to the question title when the viewport is at a mobile size? We considered this, but have some features coming that will need the space. 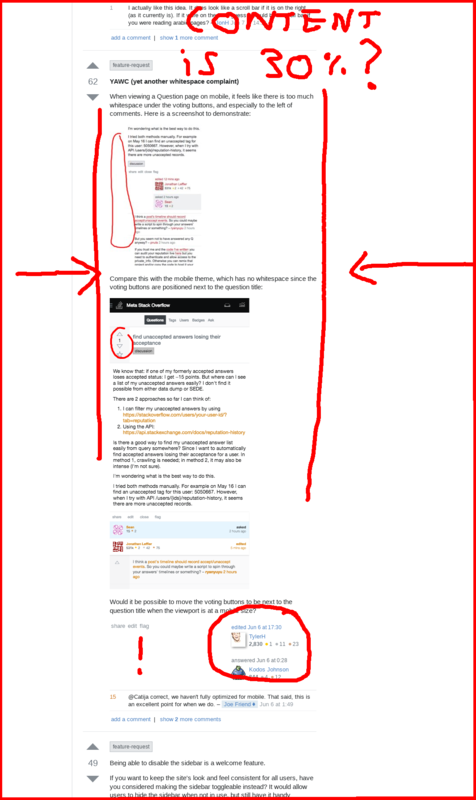 #1: I suggest that we shrink the navbar in width to about the width of the longest item ("Questions" in this case). I want it because the button I most frequently will be "Questions". Hence, I will only use 25% of the bar, so I want thing I will use rarely to take up as little space as possible. And I don't want to do 2 clicks to get there. We considered this approach but it is very hard to find icons that are easily identifiable to a large majority of people. ... or we could make such an option available to be toggled in user preferences. This will further improve allocation of space. Instead of adding a "hide" option in user settings, have you considered making the sidebar toggleable with a button instead? Site maintains a consistent look and feel between users. More intuitive than searching through settings menus1. Doesn't require changing site-specific preferences on each community. Guests can hide/show the sidebar without needing to login. Fewer preferences help keep the options menu simple. 1Currently, disabling the sidebar involves navigating through User Profile → Edit Profile & Settings → Preferences → Navigation → Hide left navigation. I'm not even sure whether the narrow-screen behavior is intended or not. I guess an accommodation for mobile devices? Please keep it! Please, please keep it! And please make the right side-bar collapsible, like the left side-bar is**. This shouldn't be a preference, it should be a button that you click (with a discoverable keyboard shortcut, of course). By the way, collapsing the left sidebar shouldn't be a user preference. Its desirability depends on the window width, so it should be possible to toggle it on a window by window basis. I think a decent compromise would be to make it a hidden preference that you can quickly toggle on the page, possibly a cookie-based rather than account-based preference since optimum window size tends to be device-dependent. I wouldn't normally request a per-user feature as it's a lot of work, but as you already have the per-user options for navigation, can we have an option to make the new left nav fixed? So it will always be there when scrolling (or not if preferred). 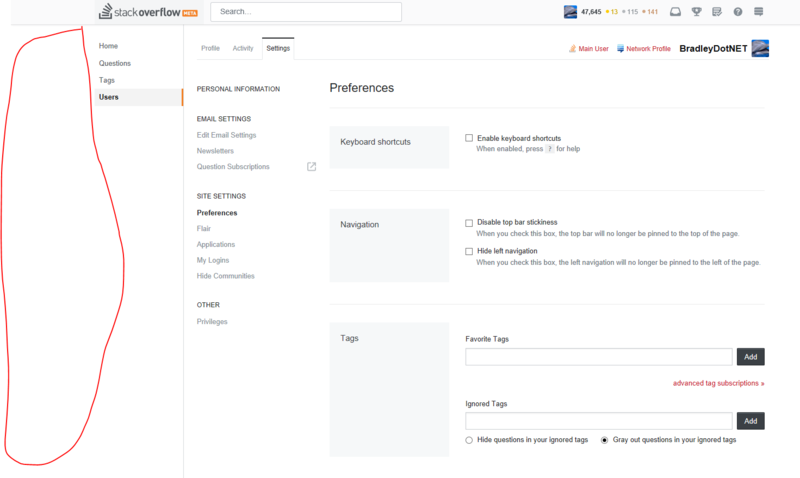 With the option already present to "disable top bar stickiness", this new requested feature will allow users to select their preferred menu to always be visible to be clicked. Or both if preferred. Is this really the intended design on smaller resolutions? and the /questions page, as @rene noted on MSO. 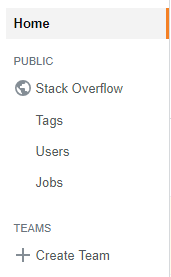 Please reduce the amount of space tags take at the top, and add clear indicators for different tags. is plain horrible. I've lost about 30% of the vertical space on my (small) second monitor purely on tags. 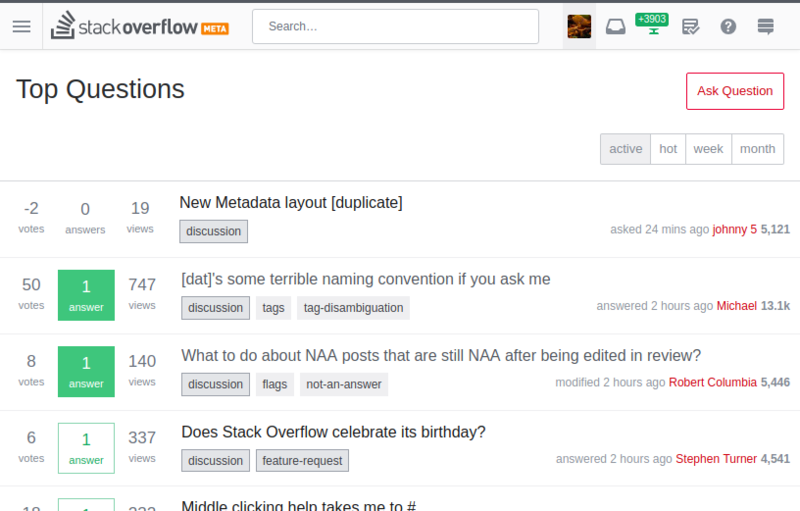 Add Help, Meta and Chat links into the sidebar. The site switcher contains some pretty major site navigation features. I'd classify them as equally important as being able to navigate to users and tags, if not more important or more likely to be used. What if we added these to the sidebar? 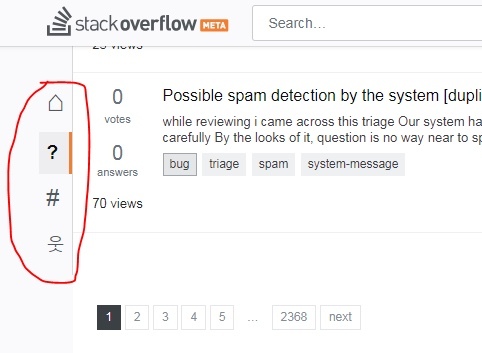 New: “Chat” and “Help” added at the bottom (the help link with its help icon to help users find it); "Meta Stack Overflow" added beneath the Stack Overflow link. 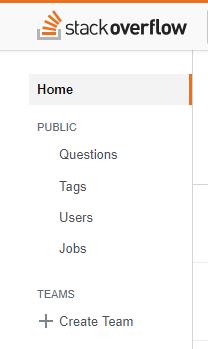 These weren't previously listed alongside Questions/Tags/Users/Jobs because that was a horizontal menu with limited space. Now we've got a vertical menu that doesn't have the same constraints. We could even move the My Communities section of the site switcher into the sidebar. It'll be appearing on every site, right? So now I can move around to other sites this way. 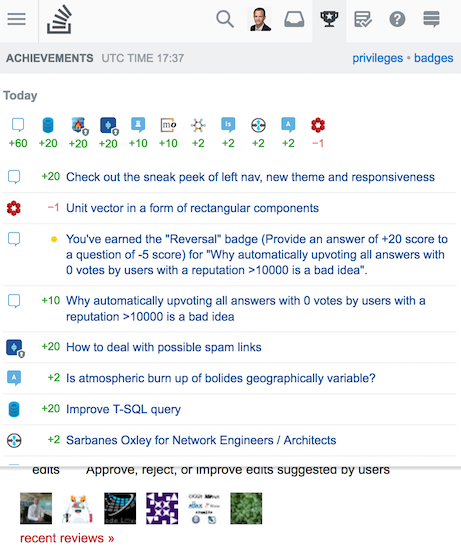 I'm not sure how I'd execute “More Stack Exchange communities” since we wouldn't want a list of all 200+ communities showing up in the sidebar, but if we added that section & functionality into the sidebar too, it would make the site switcher obsolete. A valid counter-argument for this section is to consciously keep the sidebar limited to navigating locally within the one stack exchange site, and keep the site switcher for the task of navigating to other sites. 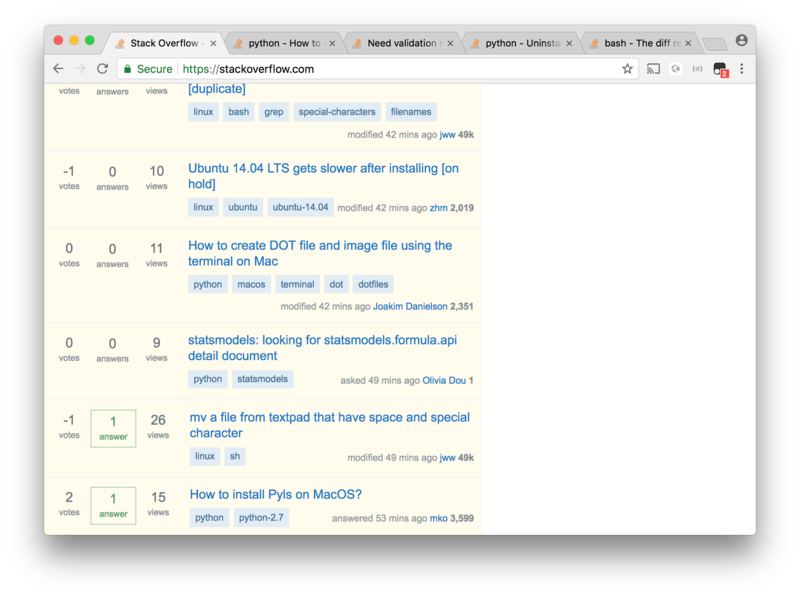 I set the preference to collapse the left side bar (“Hide left navigation”) via Meta Stack Overflow, and it's working there. But on Stack Overflow and Meta Stack Exchange, the left side bar is not collapsed and the preference checkbox in my profile is unticked. User interface preferences should obviously not depend on the site. I'm not going to edit my profile on over a hundred site! Yes, I know this is an old bug, keyboard shortcuts have had the same problem for years. So please solve it already! feature-request - Make the horizontal scroll bar optional. In other words, option for enabling and disabling responsiveness. There have been concerns from users with high resolution monitors this, this and this. My answer is from point of view from a low resolution. This benefits people who have lower resolution devices or like to have multiple windows in view. But in practice, it is not benefiting. There are some issues. I use a device with low resolution (1024x768). This is how it looks to me. 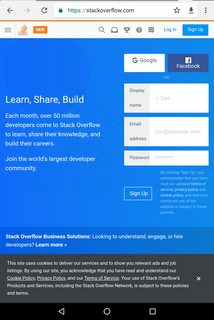 The right side bar is squeezed into a single window which makes the content (Q&A) sandwiched between left navigation bar and right side bar. They take very less space. The new responsive design fits everything in a single window. This squeezed As a result, the space taken by the right side bar didn't change but the space occupied by Q&A on the screen has decreased. 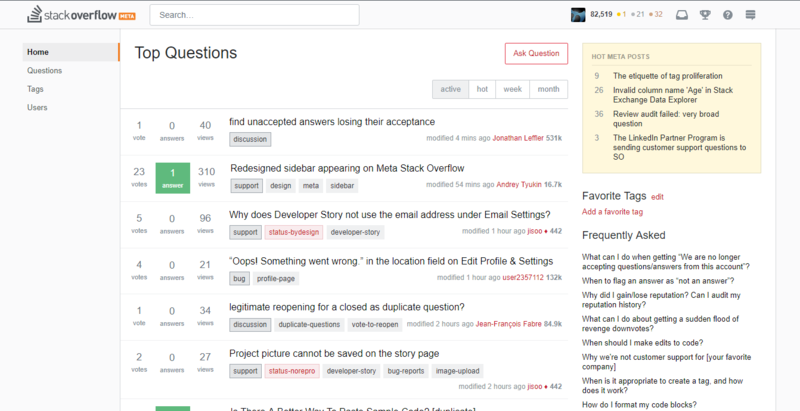 In the current design, the main focus is on Q&A. We can scroll with the help of horizontal scroll bar the missed part in the right side bar. 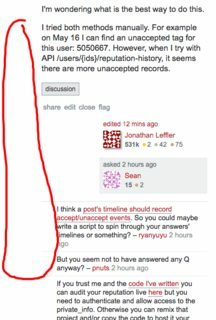 The space taken by Q&A is not affected at all. So, that should be continued. At least there should be an option to select it. The look of the question is also damaged. 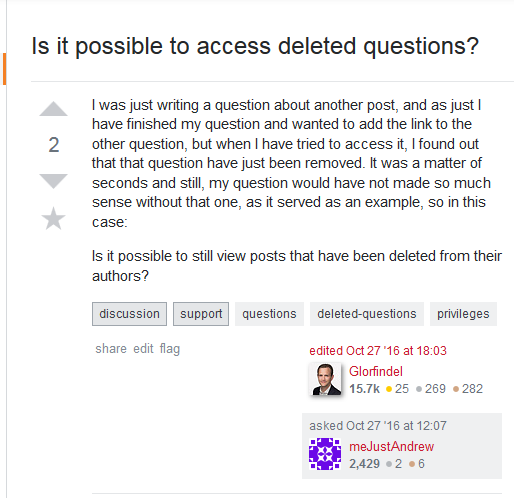 If the question is edited by a user other than OP, the editor's avatar and OP's avatar shows in vertically rather than side by side. If the bar is always disabled, it is as good as not having it at all. If this left nav is only limited to users with high resolution devices, the goal of having a nav bar is not achieved. I hope having horizontal scroll bar will solve this problem. 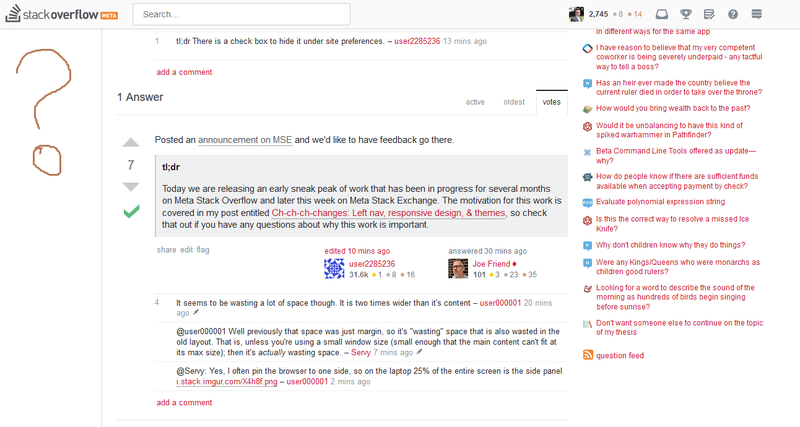 bugstatus-completed When the left navigation bar is enabled, users are not be able to comment properly. 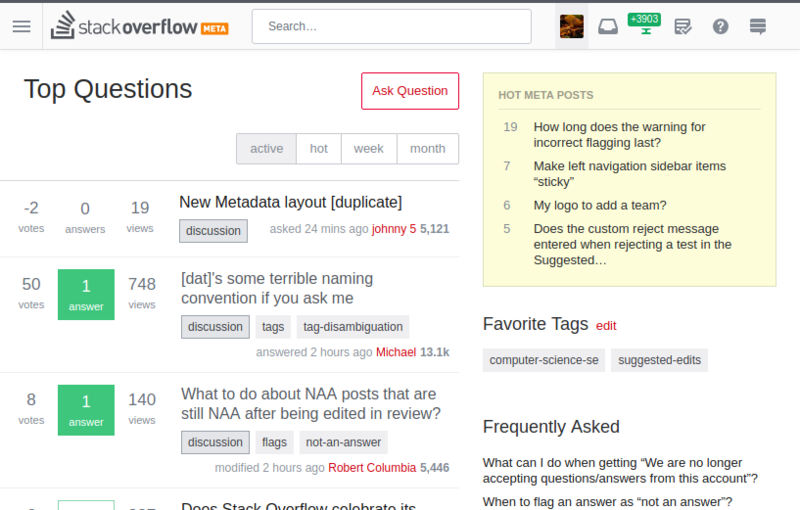 "Add comment" overlaps with the Hot Network questions. We all are humans (well, most of us), we make mistakes. If we click on any o Hot Network question mistakenly while clicking on "Add comment", it takes us to a different site. We should get back to the comment and write it again. It is a waste of time. Not only it's an issue of time management, it doesn't good. This effect can be minimized to some extent if the navigation bar is disabled. 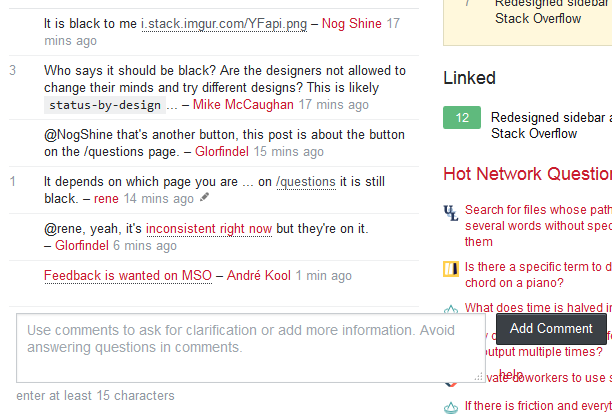 But there is an overlap of "Add comment" with the Hot question bar. 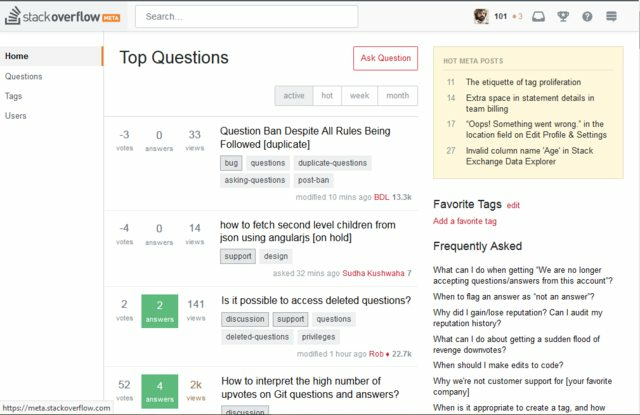 Add comment button touches the site icons in Hot Network Questions. It doesn't look good. status-planned We still have a scroll bar in the profile page in the new responsive design just like the old design. Some user reported it as a bug but that should not be removed. I request that sort of behavior for the devices with low resolution. Users with higher resolution do not see this scroll bar at all as the current design and responsive design fits within a single window. So, there would not be a problem for them. It will be helpful for us. Regarding sticky Topbar, it is an excellent choice. The left navigation bar is almost empty. It would be great if more options are added into it. Home and Questions are the ones many visit. Add more frequently visited options in the left navigation bar. That's all from me at the moment. I use a vertical display for my browser (so 1080 px wide), see screenshot for the aspect of SO in my browser. While wide margins are probably fine on wide displays, here the amount of margins on both sides really reduces (and vertically squeezes) any content, to the point that only about 30% of the screen is used - that feels like a waste. I'll definitely disable the left navigation, but if you want the website to be responsive, I'd recommend to start removing margins at wider displays than now. 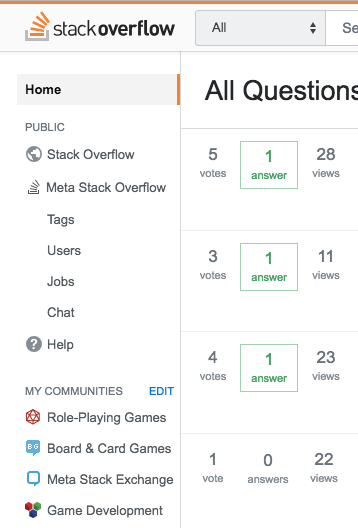 feature-request user cards next to each other. I think there is somewhat of a misconception around responsiveness. Just making things more vertical doesn't make necessarily make them better on a less wide screen. What you want is wider content, better use of space. On the same screenshot, you can see that the editor usercard is now vertically stacked with the author usercard. This wastes even more space, even though there is more than enough space to fit them horizontally. And again, this is a copious waste of space. There are some coming features that need the extra space, so we can't make it more narrow. Making adjustable is complex and we won't be doing that at this time. Can we narrow the right column in smaller viewports without removing it entirely? Below around 800px the right column moves to the bottom of the page, which is good for phones but loses some important information (question stats, professional disclaimer, community bulletin). As soon as the right column appears, though, it grabs something like 300-320px of width. If that kicks in at about 800 px, that's around 40% of the width, which is too large a proportion for a page that should be focused on the Q&A. 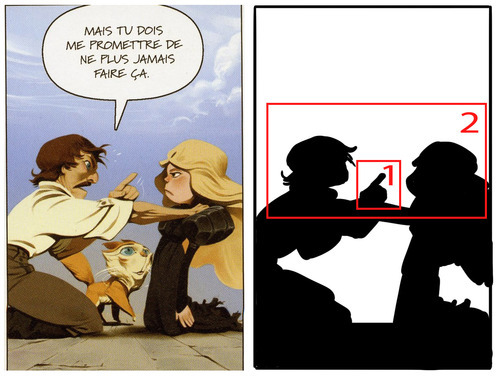 I'm browsing at about 1100px right now and it still looks a little greedy. All of this is with the left nav already collapsed, to be clear. Most of this content would fit just fine at a smaller width; mostly it's text and that can wrap. In fact, it worked fine at, if I recall correctly, 220px for years before being widened to accommodate standard ad sizes. On sites without this change, part of my right column is behind a scrollbar and that's fine; it's lower-priority content, after all. But responsive design means "make it all fit, no horizontal scrolling". I don't begrudge the ads; in fact, I look at them (or, on sites that don't yet have this change, most of the width of them and I'll scroll if it's something I haven't seen before). But I'd like the right column to be less dominant on smaller viewports. Is there some way to meet both needs? Is there some place to put the ads so that they're fully visible without claiming that entire slice of vertical space? Do we have the option to change the width of the column partway down, so that after the ad we can shrink HNQ and give Q&A more space? I'm just brainstorming here, not proposing a specific solution. 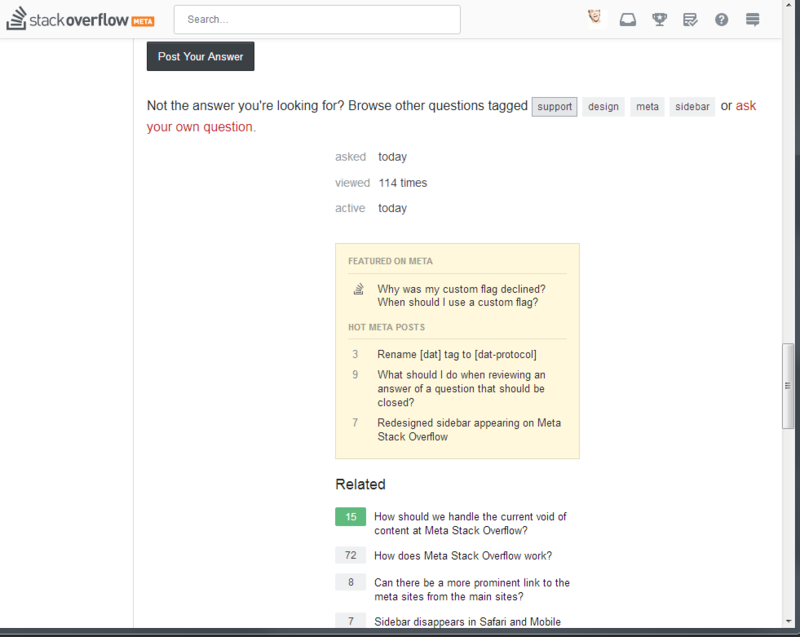 I don't like the enormous amount of space at the top of the Question list pages (home page and /questions). I use a 19" monitor for my normal browsing, and on that size, that's pushing the questions even further down the page. I could see splitting it up like it is as the width of the page gets smaller, but at full width, that's a lot of unused space. The original mockup is below, but it's missing tabs. 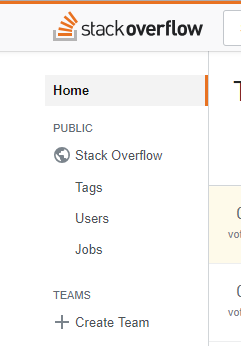 The new left navigation on Stack Overflow seems to be over-complicated due to Teams, despite not being a Teams user. 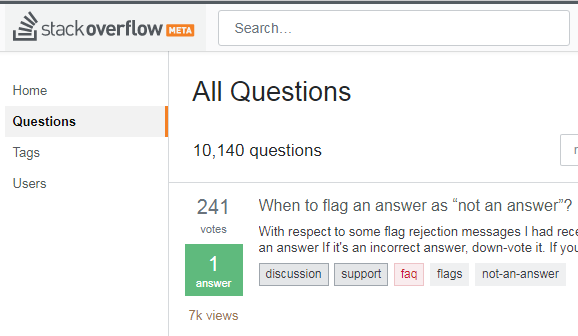 The "Stack Overflow" link below "PUBLIC" actually takes you to /questions. 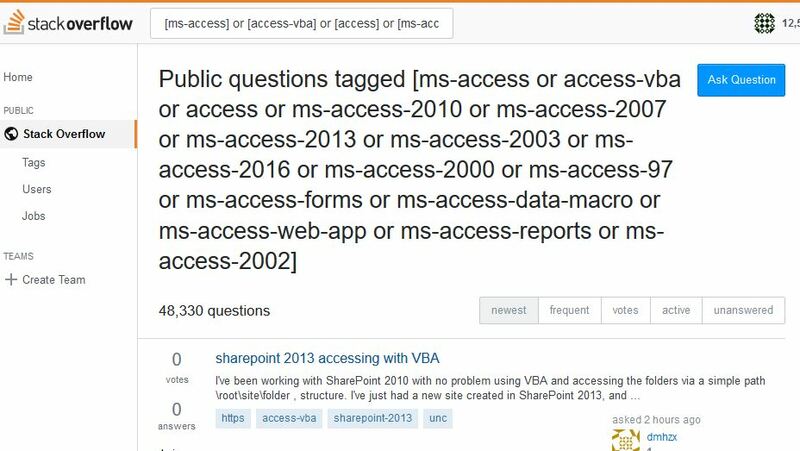 Shouldn't it be called "All Questions" instead, otherwise you have two "Stack Overflow" links on the same page that take you to different pages? 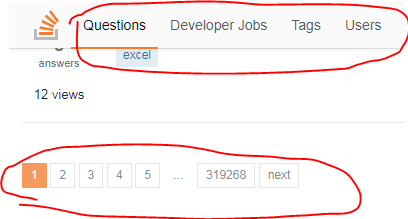 Finally, I was informed in another MSE post that the SO link with the globe icon is actually at a higher indentation level than Tags, Users and Jobs. The globe icon makes them look to be at the same level of indentation. Is it necessary? 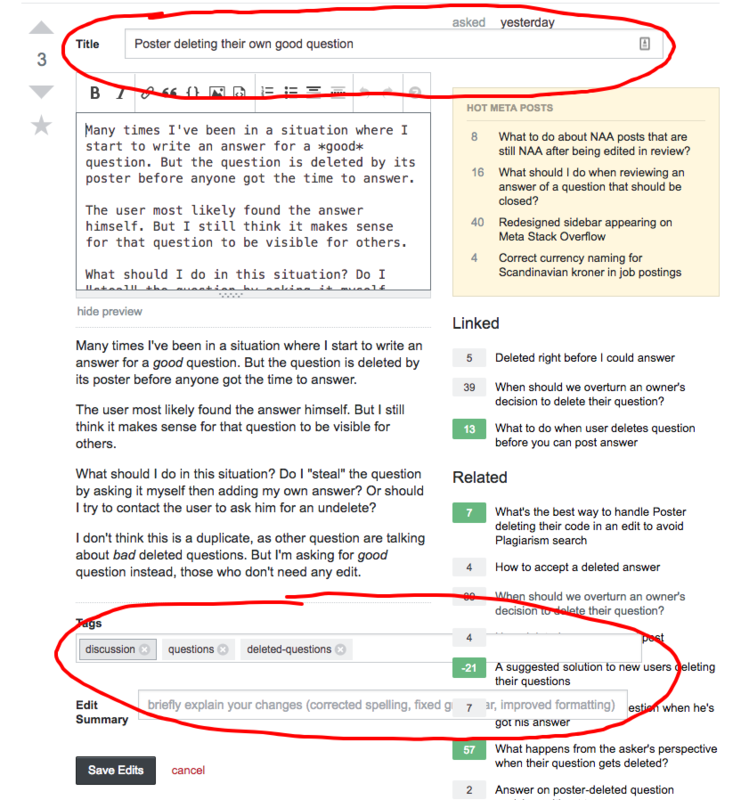 When editing a question at certain viewport sizes, the textboxes for the title, edit summary, and tags extend into the sidebar. This also happens for the edit summary when editing answers. See screenshot below. I know their shape has been unified to the default arrow in an effort to standardize the sites' theming. However, the colour mismtach is rather unpleasant since it is in stark contrast to the rest of the site's visual impression. This has been brought up in previous feedback iterations, but it had been hinted that at least the button's colour would be based on the sites' existing design and themes. So maybe this is just a bug. Let me be brutally honest, I much rather the current site. First, (I do not use SE on mobile, however) how is left-nav more mobile friendly? Secondly, how is left-nav a better user experience? Even if the menu does not scroll? I'm not a fan of the left nav, but I love the way that YouTube does it: http://youtube.com. It actually hugs the extreme left side of the window, preserving space for content. The left nav is fixed and can be scrolled independently of the main content. So if we got to have a left nav, might I suggest that you just straight-up copy YouTube's design? That would be great IMO. One thing to note about YouTube's design is that if you resize the window, you will notice that the left nav collapses very easily. It allows for a LOT more space for content than the responsive design here. I think that is a complaint that many people have made so far. It just feels too squished with the left nav AND right sidebar. I think the left nav should collapse BEFORE it even affects the old max-width. So you should really only see it if you have the whitespace there to accommodate it (for example, if you are on widescreen monitor and the window is maximized, which is fairly common). But if not, it should be collapsed. I don't know much about history web design, or whether "responsive" is equivalent to "the user shouldn't have to scroll to the right or zoom out". But I don't like this change. But alas, that's the Desktop view of my mobile browser (Firefox), which has its own problems. And I can't zoom out again. I can read this very clearly at, I kid you not, at one and a half meter (that's about five Freedom Units) distance from my phone. The feature request: please don't do responsive like this. Let me zoom out to get more text on my screen. Not exactly the world's most welcoming landing page, is it? And yes, as others have noted, it's readable from a distance of about six feet on a seven-inch tablet. All of this is unnecessary. The white space reserved for the left nav keeps stealing screen real state long after the left nav is no longer in sight. Why? Why do you think that this is needed? SO has many problems but the UI it's not really one of them (until you go and change it and make it a problem). Btw, "Hide navigation" it's not working for me. Because I really don't like the space wasted by the left-sidebar, I created Left-sidebar in the Topbar, which moves the left-sidebar into the topbar on all SE sites which have the left-sidebar, regardless of the preference set on each individual site. Installing this userscript is equivalent to having selecting a SE network-wide preference to "Hide left navigation". You will not need to set the preference on each individual site. One thing not yet mentioned in the other answers is the inclusion of the + Create Team link. As a user that has no intention of subscribing to the Teams feature, this is just noise. If at some time I do decide to subscribe I would make a conscious effort to seek out the sign-up page. Having this displayed front and center on every page seems a bit desperate.